The forecast was dodgy but the early morning sunshine got me motivated to get out of bed and head out to the All Ford Day. This event has been around for some time and over the years has moved from Liverpool to Warwick Farm and now Eastern Creek International Raceway. 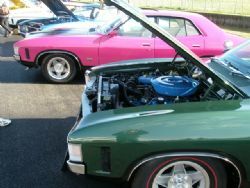 You can be guaranteed the blue oval brigade will be out in force and the number of cars, spectators and vendors did not disappoint. Even though my garage currently consists of Mopar and GM I am not a diehard loyalist and enjoy all manner of classics, Ford included. 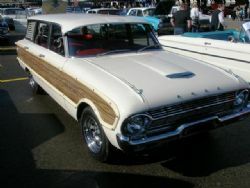 Everything from clunkers to concourse, Capri to Consul and Cortina to Customline was on display. I like Eastern Creek as a venue. Even though I need to take a cut lunch with me (it takes me an hour and half to get there) it has ample parking, is easy to get in and out of and the venue has plenty of space to cater for any size show. This show is outstanding value as well – two dollar entry, free parking. It doesn’t get much better than that. I reckon there would have been in excess of eight hundred Fords in attendance, with all the usual suspects well represented. It seemed everywhere you looked there was another Mustang, the bulk of which were quality drivers with a smattering of Shelby show ponies thrown in to mix it up. A large contingent of pristine XA/XB GT’s were sitting out on the home straight, as were a good collection of Cortinas , Anglias and Fairlanes. XR through XY models always feature prominently at this show and this year was no different. 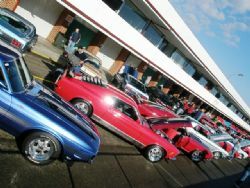 Cosworths, Escorts, twin cams, LTDs, Sierras, Falcons – all shapes, sizes and models from Australia, US and UK were present and looking resplendent in the sunshine. 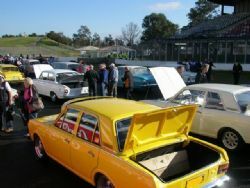 The various Ford clubs had done a great job in getting their members along and it was evident there was a very strong camaraderie between all the members as they checked out all the Fords spread around the track and grounds. The veteran and vintage Fords were well represented, with a number of 28, 29 and 30 models in attendance and a few more pre war vintage cars on display. Given the world’s most popular hotrod is a 32 Ford it was surprising to see none in attendance. There were a few original 32’s on display that attracted a lot of attention and the vendors in the pit lane sheds seemed to be very busy.